Austrian architect Raimund Abraham on Daniel Libeskind’s winning design for the redevelopment of the World Trade Center site. 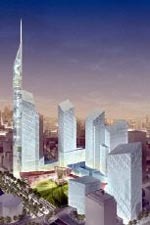 What is your opinion of the events that led to Libeskind being named as the architect for the rebuilding of Ground Zero? It was an unworthy episode in New York’s history, the way the architects prostituted themselves....There is an issue at Ground Zero as to which events ought to be commemorated by what is built there. Two very different dimensions are involved: The first is political, because the attacks affected America’s self-image; the other is the human dimension, because people lost their lives....I would describe Libeskind’s proposal as a theme monument, just as there are now theme restaurants and theme banks in America. But when you judge this project, you must also realize that the proposal, as Libeskind designed it, will never be built. The building complex will, in the end, look different? Of course. There are so many pragmatic factors at work.... People will respect Libeskind’s proposal only as an outline. A bunch of other architects will be brought into the job. This is more a working plan, a suggestion, about where it should be built, and how tall. In your opinion, will the central tower not be built, or be built differently? And it seems to be heavily loaded, symbolically. Where symbolism is created artificially, there is only a short distance to kitsch. I consider all the other projects proposed for Ground Zero as utterly speculative as well. There was not a single proposal that even to some extent expressed the radical nature of the event. What is happening now is media propaganda. People want to say: We held an international competition, a recognized architect won, so Project Ground Zero has been brought to a successful conclusion. Libeskind, in the last few weeks, has already agreed to several compromises. A decisive symbolic gesture in his proposal, for example, was that it was to be excavated down to bedrock. That was unacceptable for pragmatic reasons: Now, instead of 30 meters, it will go just 10 meters deep—and the subway will run underneath it. And doesn’t that sound a little bit like 1933 in Germany? There are also other similar methods in play, such as those about making martyrs. I find all of this repugnant. You presented a proposal for Ground Zero in early 2002, too. In my proposal, there would have been three giant blocks, with slats cut into them. Four times a day—timed to the exact minute that the two airplanes hit the towers and that the two towers collapsed—sunlight would come through the slats as a memorial. I took into account that people need to have, above all, offices and apartments built there. But...people would also remain aware of what happened in that place. A spatial abstraction of time. That would have been an attempt to have a kitsch-free project? Yes, but I also refused to make the footprints of the twin towers into something holy. I watched the towers going up from my studio windows, and I saw them collapse, too. Architecturally, they were not important, but they had become old friends, like mountains. You felt their absence, this void, as well. Now Ground Zero is being exploited, but that is our times.